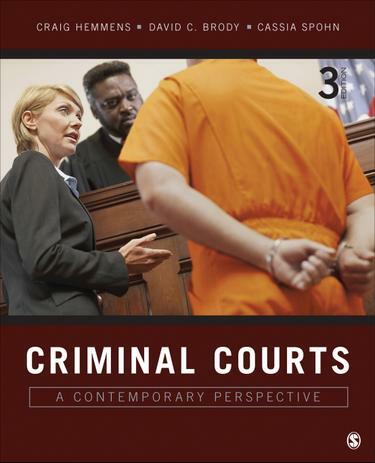 Written by three nationally recognized experts in the field, Criminal Courts: A Contemporary Perspective explores all conventional topics (court structure, courtroom actors, and the trial and appeals process) as well as others seldom covered, such as specialty courts and the goals and functions of the law. Authors Craig Hemmens, David C. Brody, and Cassia Spohn take a comprehensive and accessible approach which allows instructors to cover all of the “standard” material and the option to add selections they consider interesting and relevant to their particular course. This text will provide students with an understanding of the foundational concepts and enable them to hold a detailed discussion about the criminal courts system and the participants involved. Packed with contemporary examples and new pedagogical tools, the Third Edition has been thoroughly revised with the most up-to date content and resources to give students a more comprehensive understanding of the criminal courts system. Additional instructor resources and study tools can be found online at www.sagepub.com/hemmens2e.